"Anyone who approaches the Zionist problem in a moral aspect is not a Zionist." Prime Minister Benjamin Netanyahu said during a tour to the construction site of a barrier on the eastern border on Tuesday that he wishes to surround the country with fences and barriers "to defend ourselves against wild beasts" that surround Israel. Dehumanization of one's real or perceived adversaries, often in the form of animalization, has long been a hallmark of propaganda. As Netanyahu reinforces Israel's garrison mentality, he continues building a literal fortress by extending the apartheid wall further around the Zionist state, promising more division, segregation, discrimination, and violence. Such rhetorical tactics are nothing new. In 1927, the influential communications theorist Harold Lasswell published his reflection on World War I, entitled Propaganda Techniques in the World War. "So great are the psychological resistances to war in modern nations," he wrote, "that every war must appear to be a war of defence against a menacing, murderous aggressor. There must be no ambiguity about whom the public is to hate." Lasswell added, "Guilt and guilelessness must be assessed geographically, and all the guilt must be on the other side of the frontier." "For most human beings, it takes an awful lot to allow them to kill another human being," Anthony Pratkanis, a psychology professor at the University of California, Santa Cruz, told ABC News back in 2003, as the United States was gearing up to invade Iraq. "The only way to do it is to justify the killing, to make the enemy look as evil as possible." The report also quoted Hayward communications professor James Forsher, an expert on propaganda films. "The secret in propaganda is that when you demonize, you dehumanize," Forsher explained. "When you dehumanize, it allows you to kill your enemy and no longer feel guilty about it. That is why during World War II, a lot of caricatures became animals... You can kill a monkey a lot more easily than you can kill a neighbor." Nazi dehumanization of Jews as "vermin" to be exterminated and American anti-Japanese caricatures of rats and snakes from the 1940s are especially grotesque, but the phenomenon was around long before that. Anti-Tsarist and, subsequently, anti-Soviet propaganda often employed the image of an octopus, spreading its imperial tentacles across the globe. 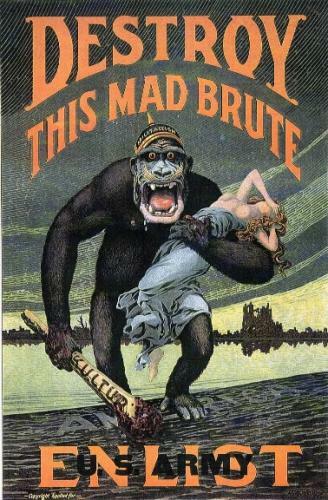 During World War I, Germany was depicted as a crazed, club-wielding gorilla in a U.S. Army poster encouraging enlistment. In their 1994 book, Unthinking Eurocentrism: Multiculturalism and the Media, Ella Shohat and Robert Stam note that the common colonial/racist trope of "animalization" was "rooted in a religious and philosophical tradition which drew sharp boundaries between the animal and the human" and "renders the colonized as wild beasts... projected as body rather than mind." Zionist colonists and Israeli officials have for years employed this type of rhetoric to dehumanize those they seek to forcibly displace, dispossess, disenfranchise, oppress, occupy and subjugate. The Zionist project is always presented as a bulwark of civilization against the savagery and barbarism of the brutish Eastern, Arab, African, and/or Muslim hordes; the settlement on the hill; the light amidst the darkness; the "villa in the jungle," as Ehud Barak once said. "At the end, in the State of Israel, as I see it, there will be a fence that spans it all," Netanyahu fantasized yesterday. "I'll be told, 'this is what you want, to protect the villa?' The answer is yes. Will we surround all of the State of Israel with fences and barriers? The answer is yes. In the area that we live in, we must defend ourselves against the wild beasts." The animalization of Palestinians, and other perceived enemies, in Israeli rhetoric goes back decades. 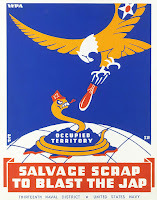 Shortly after Israel seized military control over the West Bank and Gaza in 1967, Israeli Chief of Staff Moshe Dayan told officials in his center-left political party, Rafi, that unless Palestinians in the newly-occupied territories make "peace" with Israel, they "shall continue to live like dogs, and whoever wishes may leave, and we will see where this process leads." The fate of a million and half a million Jewish children has been different from all the children of the world throughout the generations. No more. We will defend our children. If the hand of any two-footed animal is raised against them, that hand will be cut off, and our children will grow up in joy in the homes of their parents. In April 1983, outgoing Israeli Chief of Staff Rafael Eitan (who was losing his post due to his responsibility for the 1982 Sabra-Shatila Massacre) reportedly told the Knesset's Foreign Affairs and Defense Committee, "The Arabs will never win over us by throwing stones. Our response must be a nationalist Zionist response. For every stone that’'s thrown, we will build ten settlements. If 100 settlements will exist, and they will, between Nablus and Jerusalem, stones will not be thrown. 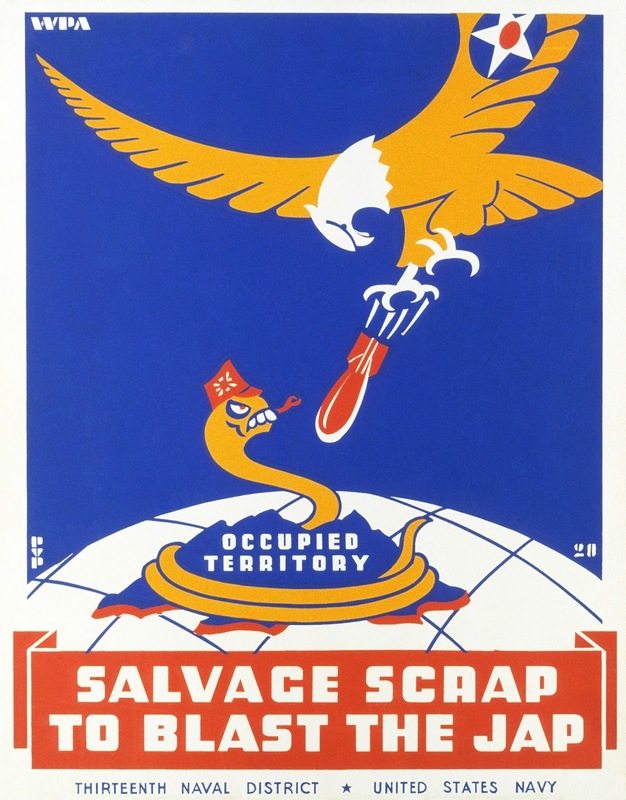 If this will be the situation, then the Arabs will only be able to scurry around like drugged roaches in a bottle." During the First Intifada, on March 31, 1988, Israeli Prime Minister Yitzhak Shamir told reporters at the ruins of an ancient Herodian fortress in the occupied West Bank, "Anybody who wants to damage this fortress and other fortresses we are establishing will have his head smashed against the boulders and walls," adding that Palestinians who resist the Israeli occupation "are like grasshoppers compared to us." In late 2004, Yehiel Hazan, a Likud minister and leader of the biggest settler lobbying group, declared on the floor of the Knesset, "The Arabs are worms. You find them everywhere like worms, underground as well as above," adding, "Until we understand that we're doing business with a nation of assassins and terrorists who don't want us here, there will be no let up. These worms have not stopped attacking Jews for a century." On June 30, 2012, Israeli lawmaker Ayelet Shaked of the religious nationalist Jewish Home party posted a Facebook message that identified "the entire Palestinian people is the enemy" and calling for the total elimination of Palestine, "including its elderly and its women, its cities and its villages, its property and its infrastructure." The post, alleged written years ago by now-deceased settler leader Uri Elitzur, added that Palestinian mothers should be executed for giving birth to "little snakes," that is, Palestinian children. Less than a year later, Netanyahu appointed Shaked to be Israel's Minister of Justice. In mid-2015, Netanyahu appointed as new Deputy Defense Minister Eli Ben-Dahan, a rabidly racist rabbi who also belongs to the Jewish Home party in the Knesset. A couple years earlier, on August 1, 2013, Ben-Dahan said in a radio interview, "To me, they [Palestinians] are like beasts, they are not human." Later that same year, Ben-Dahan insisted that "a Jew always has a much higher soul than a gentile, even if he is a homosexual." As Deputy Defense Minister, Ben-Dahan is now responsible for the "Civil Administration" of Israel's martial law in the West Bank. "The Civil Administration," a blogger for the Israeli media site 972+ has pointed out, "is responsible for all aspects the occupation that don’t involve boots-on-the-ground security operations — it administers planning, building, and infrastructure for both Jews and Palestinians in Area C of the West Bank. It also administers the Palestinian population database and is responsible for granting and revoking entry and travel permits for Palestinians, controlling every aspect of their movement." "In other words, the man slated to take charge of an organization entrusted with supervising the theft of Palestinian land and supervising Palestinians' lives, is a racist who said he does not see them as human, but rather as animals." 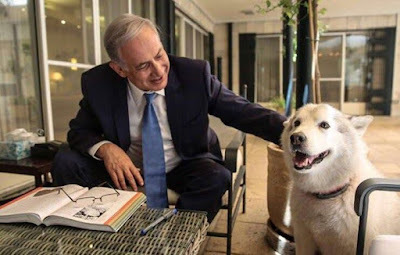 Netanyahu, too, has a penchant for animal allusions when speaking about those he despises most, be they Palestinians, Iranians, or Muslims, in general. [Israel's] critics continue to press Israel to make far-reaching concessions without first assuring Israel's security. They praise those who unwittingly feed the insatiable crocodile of militant Islam as bold statesmen. They cast as enemies of peace those of us who insist that we must first erect a sturdy barrier to keep the crocodile out, or at the very least jam an iron bar between its gaping jaws. Netanyahu probably didn't realize he was channeling his fellow apartheid champion, P.W. Botha, who led South Africa from 1978 to 1989, and is credited with complaining that "the free world wants to feed South Africa to the red crocodile [Communism], to appease its hunger." Botha, incidentally, was widely known by the Afrikaans nickname Die Groot Krokodil, or "The Big Crocodile." The following March, in one of his most tedious diatribes about the non-existent threat of a nuclear-armed Iran, Netanyahu told attendees at AIPAC's annual conference that Iran's fully safeguarded uranium enrichment facilities and medical research reactor were actually a cover for a clandestine nuclear weapons program. Ladies and Gentlemen, if it looks like a duck, walks like a duck, and quacks like a duck, then what is it? That's right, it's a duck – but this duck is a nuclear duck. And it's time the world started calling a duck a duck. Appearing on Face The Nation on July 14, 2013, Netanyahu decried Iranian president-elect Hassan Rouhani as a "wolf in sheep's clothing," whose devious Persian strategy is to "smile and build a bomb." He repeated this description to a group of U.S. lawmakers the following month. On October 1, 2013, Netanyahu returned to the UN General Assembly and accused Rouhani of being a "wolf in sheep's clothing." "Rouhani doesn't sound like Ahmadinejad," Netanyahu wailed. "But when it comes to Iran's nuclear weapons program, the only difference between them is this: Ahmadinejad was a wolf in wolf's clothing. Rouhani is a wolf in sheep's clothing, a wolf who thinks he can pull the eyes -- the wool over the eyes of the international community." Fittingly, Netanyahu's faithful lapdog, Yuval Steinitz, also took to the media in July and September that year to describe Rouhani the same way. Updated 02.11.16 to include references to Iranian President Hassan Rouhani as a "wolf in sheep's clothing," which I inexplicably omitted in my original post. Thanks to @PersianSteel for bringing this to my attention. The image was obtained by Ben-Gurion University of the Negev student Moran Mekamel. September 20, 2017 - Well, it's that time of year again. In his latest performance of propagandistic pabulum before the UN General Assembly, Israeli Prime Minister Benjamin Netanyahu unloaded all of his usual, tired talking points about Iran. I warned that when the sanctions on Iran would be removed, Iran would behave like a hungry tiger unleashed, not joining the community of nations, but devouring nations, one after the other. And that’s precisely what Iran is doing today. So, now Iran is a "hungry tiger." Got it. Not one to quit while he's already behind, Netanyahu had one more animal allusion teed up to make his sycophants in the balcony swoon and bore the rest of the dwindling delegations that stayed for his speech. Now, it’s true. I haven’t yet visited Antarctica, but one day I want to go there too because I’ve heard that penguins are also enthusiastic supporters of Israel. You laugh, but penguins have no difficulty recognizing that some things are black and white, are right and wrong." What the transcript of this pathetic routine fails to capture, however, is that no one watching the speech actually laughed. The joke, indeed, is Netanyahu himself. February 18, 2018 - In order to distract attention from his mounting corruption scandals, Benjamin Netanyahu is again raising the specter of a ferocious Persian kitty, lurking in the dark underbrush and waiting to pounce upon poor, unsuspecting Israel. And so, back are tired appeasement comparisons along with the good ol' "tiger" metaphor, as Netanyahu claimed in a speech today that the 2015 Iran deal he and his lobbyists in Washington are desperate to destroy has "unleashed a dangerous Iranian tiger." As tiresome propaganda goes, this one's purrrrrfect. March 22, 2018 - Well, this isn't a hard one.